Authentic Mexican cuisine centers on its sauces. There are cooking sauces, table sauces, and bottled sauces galore; rarely will a snack or meal in Mexico be served without some sort of sauce on it or accompanying it. Despite the narrow meaning it has in the United States, the word salsa can refer to any type of sauce in Spanish. Anything from ketchup (salsa cátsup) or Worcestershire (salsa inglesa) to Hollandaise (salsa holandesa) to an Asian sweet and sour sauce (salsa agridulce)—they are all considered salsas. The American concept of salsa, a tomato-based mixture intended as a dip for chips, is just one example of the many and varied Mexican salsas. Table sauces are those placed on the table or served on the side of a dish for each person to pour, sprinkle, or spoon onto their food in the desired amount. They tend to be spicy, but the degree of spiciness varies greatly, depending on the types of peppers used in their creation, the intended “target” food(s), and regional as well as personal taste. The American “salsa” is considered a table sauce—but it’s just one of the hundreds of varieties available. Table sauces exist to turn the ordinary into the extraordinary, so don’t relegate them to simply chip dip. Try them on fried or scrambled eggs, plain meats, pasta and cheese dishes (from quesadillas to mac and cheese to souffle), hamburgers and hot dogs, baked or fried potatoes, soups and stews, and tacos—most especially tacos. Pickled jalapeño peppers and similar condiments: Though not exactly sauces, they also fit in here, for the simple reason that they are served in a similar way to table sauces. In general, the choice of table sauce depends on personal taste and possibilities: Make the one you like the most or the one for which you happen to have the ingredients on hand. For guests, it often makes sense to prepare more than one (with varying levels of piquancy)—a red one and a green one, for example, or a creamy guacamole and a spicy tomato salsa—to give them a choice. There are, of course, a few dishes that are traditionally served with one particular table sauce. For example, cochinita pibil, a braised pork dish from the Yucatan, is usually accompanied by an onion and habanero sauce, and tacos al pastor, a pork and pineapple pairing, seems to go naturally with chile de arbol sauce. Pay attention to table sauce recommendations in a particular Mexican recipe for inspiration. Cooking sauces provide the basis for a recipe. They tend to be spicy, although often not to the degree of table sauces; this allows each diner to better control the heat level of their own plate at the table. One of the best things about Mexican cooking sauces is their versatility. While some cooking sauces are closely identified with specific dishes (chicken or turkey with mole sauce, for example), practically any cooking sauce can be used in many different ways. An example: Pork in green sauce is delicious—as is chicken, beef, chicharrón, sausages, or even eggs. 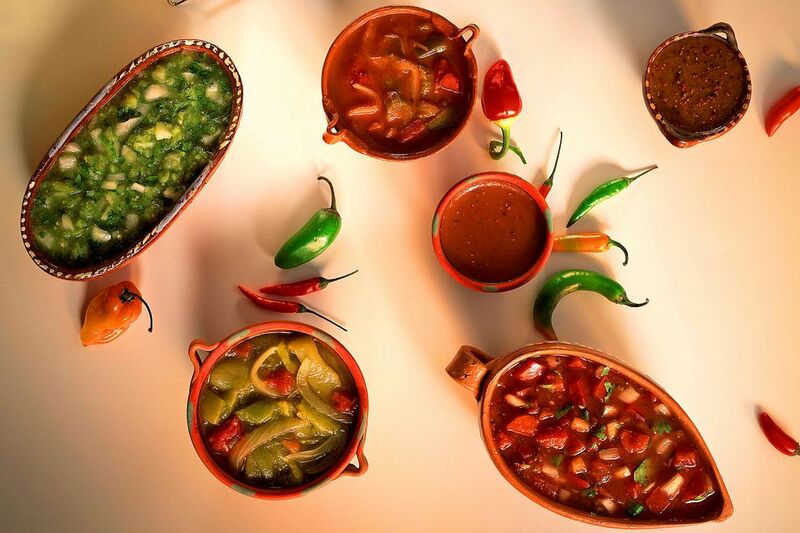 Sauces are often helpful when adapting traditional Mexican dishes to the tastes and needs of each family’s particular circumstances. Time to reduce your consumption of red meat? Cooking sauces almost always work just as well with chicken, fish, or tofu. Need to save money? An egg can be a feast when it's cooked in a delicious sauce. Learn to make just one Mexican cooking sauce and you will you have added a powerful, versatile staple to your repertoire. Tomato and tomatillo sauces are delicious creations that have one of those ingredients as their main element. They usually also include either fresh or dried chile peppers, onion, salt, and/or garlic, and sometimes additional ingredients. Examples include ranchera sauce and Veracruz sauce. Moles tend to be relatively thick and complexly flavored sauces that contain a variety of seeds, herbs, and spices. Some well-known moles are mole poblano, Oaxacan black mole, and green mole. Pipianes are relatively thick sauces made from squash seeds or other seeds that are ground and cooked with other ingredients. Cream sauces appeared in Mexico’s cuisine during the nineteenth and early twentieth centuries, a time when everything from France—including French cooking—was in fashion among the upper classes. Cream and cheese sauces are often used in Mexico to this day in dishes intended for holidays and special occasions, such as cream and walnut sauce poured over the classic chiles en nogada.